Page 7 shows how the Walthamstow gyratory will be operating for the next 7/8 months while the bridge is being built on the gyratory. Furthermore, I have heard rumours that the 'through' buses, i.e. 97 and 357 may not serve the bus station during this time and even possibly ever. Does anyone know anything about that? It would explain the mystery of these proposed 'better positioned bus stops'. The bus station widening is complete and so I guess we will find out soon enough. 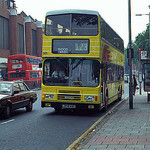 However, the large numbers of buses combined with general traffic have led to concerns over queuing and wait times between the Hoe Street/Selborne Road and Walthamstow bus station junctions, as well as safety concerns about passengers exiting buses prematurely at the bus station junction. What does this even mean? Literally, as someone mentioned, this is what will happen post the changes! Bizarrely, of the three barrier entrances to WC, the most able to cope, will be the least used post these changes. I still have not seen any official confirmation that the bus lane entrance will be removed, although, it almost certainly seems the case. The London Borough Of Waltham Forest has opened consultation about changes to road layouts around Selborne Road and Hoe Street at Walthamstow Central Station. This includes bus stopping arrangements in the area. The removal of bus routes 97 and 357 from the bus station. Routes 97 and 357 to set down and pick up passengers on Hoe Street. The removal of bus stop AP from outside Walthamstow Central Station, meaning that passengers would not be set down on Selborne Road but would continue into Walthamstow Bus Station. The LBWF document provides a link to Transport For London's consultation on the bus changes but that does not launch until 22nd June 2018. Good grief what a load of utter, utter rubbish dressed up in the finest "BS" language you can find. People wanting Leyton or Chingford have to plump for a stop on Hoe St or the bus station in order to get half the service they get today. And as for dumping everyone in the bus station rather than on the current layby. These clowns clearly have NO idea how people use buses in Walthamstow. A whole load of interchange options are worsened as a result of these proposals and heaven help you if you are old, encumbered or disabled and need to get a 97 or 357 under these proposals. If I could find the "poo" emoji I would insert 1 million of them right here. When they re-opened the bus station in the mid 2000's that was one of the initial arrangements IIRC that buses serving the station was not to alight on Selborne Road, but at the stop into the station. Bus station controllers were going out to get drivers who did not follow this. There became a lot of arguments between passengers and it was then dropped. Some resorting to pressing the emergency exit button. This would happen even more, with people pressing it at their own will and I do not blame them to be honest. LBWF takes the pee, they are egotistic maniacs that do loads of things over the past 10 years to pee the motorist off that then ends up affecting bus users. The 69 would get a slaughtering in the bus station in the evenings now because of this. Most people who go to Chingford Rd or Chingford Mount may now walk to the stop outside the cinema on Hoe Street to get more choice of buses. I hope these works if they go ahead are a bit quicker than the current works at Hoe St/Selborne Walk - the constant bus jam towards the station from Lee Bridge road is a joke. The trouble is this has been "engineered" by the council. After all there were minor delays, mainly on Saturday afternoon. But now tailbacks are a daily occurrence. They have closed off so many side roads for the pathetic cycle bull sh*t. They even removed the left filter turn lanes at Bakers Arms junction which helped clear traffic from the junction. Almost all side roads on approach are closed, so the in real terms buses is the biggest looser of all modes of transport from their so called improvements. I do not feel sorry for any of the residents of LBWF as they got what they voted for. They consistently vote the same party councillors they know the stupidness they get up to, but then they complain when they deliver this crap. Most people in LBWF who have complained when I spoke to them and asked who did they vote, when I told them they get what they voted for they are left speechless! The latter is from the Waltham Forest Guardian with some interesting comments added. None by me I hasten to add! TfL's response is quite hypocritical - they say the changes are to improve reliability except they worsened reliability themselves with the never ending works not just on Hoe Street but across Waltham Forest. Wholly negative response to consultation duly submitted. TFL are also relocating bus stops onto the new bridge so that routes 357 and 97 can continue straight along Hoe Street rather than turn into Walthamstow Bus Station in Selborne Road. These changes, which are expected to improve bus journey times and reliability, and were supported by more than 60 per cent of participants in the TfL consultation. It is expected that the roadworks on Hoe Street will be completed by the end of the year with the remaining planting and road improvements on Selborne Road being completed by spring 2019. Proves 60% of the respondents are stupid then. Always shows contempt from TfL that they are prepared to leak the response to the council and local press but can't be bothered to communicate the result with those of us who actually responded to the consultation. Wait until it happens and people start complaining about the idiocy of these changes. Bet the 215 sees a big spike in usage as does the 69. There could also be a corresponding fall in the numbers boarding the 97 and 357. That's if the latter ever gets to use the new stops on the railway bridge. The shelter and stop were being put in place for southbound buses when I was up at Walthamstow Central yesterday. I had seen similar reporting to that quoted by Mondraker275, in the Council's free sheet sent out to residents about a week ago. I've since checked TfL's Consultation page twice, the latest being yesterday, but there's no official response. We should remember that Waltham Forest Council conducted its own separate consultation on these changes. Strange that they are not reporting the outcome of this - or perhaps they are. Is this being interpreted as the result of TfL's consultation? The proposals were seriously flawed, making life more difficult for Waltham Forest bus users which will likely lead to a further reduction in patronage. As Snoggle so aptly puts it, "Wait until it happens and people start complaining about the idiocy of these changes". Between 22 June and 3 August 2018, we consulted on proposals to change bus operations at Walthamstow gyratory. I wanted to make you aware that we have now published our consultation report and our response to issues raised document. 544 people responded to the consultation with 53 per cent of respondents in favour of removing bus stop AP, with 34 per cent opposing. 52 per cent of respondents favoured proposals to relocate the north and southbound 97 and 357 from the bus station to Hoe Street, with 37 per cent opposing. After considering all responses, we plan to proceed with the scheme as proposed with the changes due to be implemented in December 2018. If you have any further questions regarding the scheme, please do not hesitate to contact me. The consultation report and response to issues raised document can be found here: consultations.tfl.gov.uk/buses/walthamstow-gyratory/"
Oh well chaos and confusion due in a couple of weeks then. Customer: "Oi Driver what the hell are you doing"
Q1: Were the public "consulted?" Q2: What's the point of a bus station? Of course it will - you know that, I know that, anyone with a functioning brain knows that. Sadly the massive screw up by the council over the revised road layout - 2 years of chaos and counting - means the future road layout (no set down lane by the tube / rail station) means TfL HAVE to divert many bph away otherwise the queue of buses waiting to turn into the bus station would block the road junction all day. The new right turn filter lane for the bus station will probably only be able to hold 1-2 buses so it's going to be nightmarish anyway. This is why you will note that TfL very carefully avoided saying how many route 55 buses would run beyond Bakers Arms to WWCS. They can't run the full 5-6 min headway along Hoe St as it would undo all the benefit of sending the 97 and 357 direct along Hoe St. I am now waiting for the next stage which will be to remove the 212, 275, W12, W15 and W19 from serving the Bus Station and instead forcing passengers to use the current set down only / driver change stops on Selborne Walk instead. This is what used to happen years ago as the bus station couldn't handle all the bus movements. Not a new dilemma though. All bus services over London Bridge southbound years ago (other than the 47 to Tooley Street) used to terminate in, or go via, the bus station there, conveniently situated for the NR stations. Further back, when the bus station was positioned 'the other way round' (which I can just remember) all northbound buses went that way, which really was a boon for those wanting Moorgate, Liverpool Street, etc. None of this compares, however, with the more recent situation around Victoria and Liverpool Street bus stations, with passengers dumped hundreds of yards from their true destination.